What Day Of The Week Was January 23? 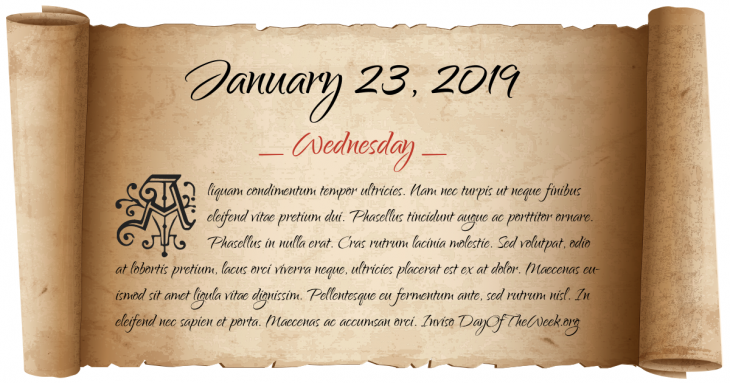 January 23, 2019 was the 23rd day of the year 2019 in the Gregorian calendar. There were 342 days remaining until the end of the year. The day of the week was Wednesday. In a coronation ceremony, Zhu Yuanzhang ascends to the throne of China as the Hongwu Emperor, initiating Ming Dynasty rule over China that would last for three centuries. Anne Boleyn, second wife of Henry VIII of England, discovers herself pregnant. The deadliest earthquake in history, the Shaanxi earthquake, hits Shaanxi province, China. The death toll may have been as high as 830,000. The first bridge over the Mississippi River opens in what is now Minneapolis, Minnesota, a crossing made today by the Father Louis Hennepin Bridge. World War II: The Battle of Rabaul begins, the first fighting of the New Guinea campaign. Reporter Daniel Pearl is kidnapped in Karachi, Pakistan and subsequently murdered . Who were born on January 23?